This entry was posted in Expert, Intermediate, Sniper Rifles, Spring/Bolt Action, Tips and Techniques and tagged airsoft 101, airsoft sniper, airsoft sniping, airsoft sniping tips, how to steady your heartbeat, sniping, sniping tips, tips for airsoft sniping, tips to become a better sniper by sirbuffalosushi. Bookmark the permalink. Elevation from target if you are shooting down, aim a little lower, vice versa shooting up. Humidity thickens the air slowing down your bullets. Distance if it’s far guess what you have to do…..yeah that’s right, aim above it! Target lead if your target is walking, shoot where it will be, not right now. Murphy’s Law: anything that could go wrong, will go wrong. When you think you got it figured out, you’re wrong. Great article for Airsoft Sniping. I’ve been a Sniper for a while, and I am always looking around for pointers, and this article, did give me a few ideas. One tip though is that a Ghillie suit is a piece of equipment, you should not rely fully on it to keep you alive. Sometimes I go WWIISET sniping, and I’m just as deadly without a ghillie than I am with one. I’ve been an airsoft sniper for some time now and I’m always looking up guides like this to find areas where I can get better. I felt that this guide is great for people who are getting into airsoft sniping because it gives you and easily understandable summary of what to expect and how to get better, but I would like to add some tips if you wouldn’t mind. For starters if you are hoping to compete at events you are going to want a co2 or gas powered pistol that can shoot accurately and constantly. Make sure it has hop-up and if possible try and find one with adjustable hop-up so that you can use heavier ammo in your pistol making it more accurate. The reason behind this is there is a minimum engagement range that most if not all snipers need to consider depending on the power of your gun. You’ll need a secondary that is light mobile and reliable when you are in sight of enemies that are too close for you sniper. Pistols also come in handy when facing multiple targets withing a close range because you’ll have a faster rate of fire. Secondly, practice moving silently. This is a must for snipers who want to sneak behind enemy lines. But silence alone wont get you past your enemies. Camouflage is also very important. Despite what most people believe though, a sniper does not need a ghillie suit to stay hidden. 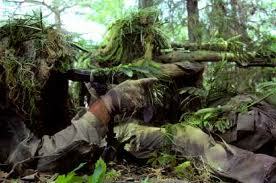 In fact most inexperienced snipers will end up being seen more with a ghillie on they without one. Why? Simple, ghillie suits are used to blend into the surrounding areas and disrupt the outline of a human figure, but just like you can see a red dot in front of a blue page right away, a ghillie suit that isn’t used correctly according to the surrounding environment will stick out like a soar thumb. Not only that but moving with a ghillie suit is an art. If you are a beginner focus on the basics of camouflage. things like stay in the shadows, don’t stick near trails, use your surroundings to camouflage you outline. ect. A ghillie suit is a tool that a good sniper will use to make himself better but unless the sniper knows how to use that tool, it will only make things worse. There are many more tips I can give but then I might as well right my own guide. SO venture out and look for more guides. Knowledge can only help and don’t be afraid to read some actual military guides on sniping if you are seriously looking into sniping. Snipers are players that can easily turn the tides on a game, but they are also one of if not the hardest role on the field so it isn’t for everyone. Good luck to all of you guys and I hope to see you guys on the field some day. This is a very very good lets say tutorial for being a good sniper. I am a newbie sniper at the moment and i dont even have a scope yet… still i find this very useful even though i havent started practising with this. You also have to take in consideration wind speed, and know how your gun shoots(Curves up to the right, ect.) Always be aware of your surroundings. Something that i personally struggled with when i was starting out was the ability to stay calm when enemy’s got close. Don’t think “Do I need to run?”, or “IM SCREWED!!!!” . Keep calm, and stay level headed. Think about things like “Who’s todays lucky bullet winner?”. 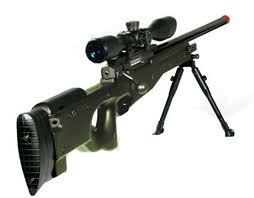 One Last tip……….. Don’t try to go CQC with your sniper, let your teammates get up close an personal with the enemy.